At mid-day on May 29, the conservative media website The Daily Caller posted an “exclusive” story titled “Trump Set To Roll Back Obama’s Cuba Policies.” The article stated that the president was planning a June trip to Miami, where he would reimpose restrictions on the right of US citizens to travel to Cuba, as well as curtail business opportunities that Obama had authorized through executive decree. The Daily Caller credited Trump’s decision “to the behind-the-scenes efforts of Republican Florida Sen. Marco Rubio, Democratic New Jersey Sen. Bob Menendez and Republican Florida Rep. Mario Diaz-Balart”—the trio of hard-line Cuban-American legislators who have pressed the president to rescind Obama’s history-changing policy of engagement toward Cuba. The information in the original Daily Caller story did not leak from inside the Trump administration. Rather, the story was sourced to “an anti-embargo group.” An astute advocate of engagement, it appears, decided to sound a political fire alarm on Trump’s pending plans for Cuba, rather than sit by as a clique of right-wing Cuban-American legislators influenced the new administration to torch a successful policy. LAWG was one of the first advocacy groups to push back against the Trump administration’s plans to roll back Cuba policy. “Its Now or Never: Stop Trump from reversing travel to Cuba!” reads a LAWG posting on May 30. The posting included an image to share on social media that states in bold letters i support engagement with cuba, and it calls for ending the travel ban and the embargo. In less than two days, it had been viewed over 37,500 times on Facebook, and had some 300 shares. The LAWG posting also exhorted readers to contact members of Congress and urge them to demand continued travel and engagement with Cuba. After years of efforts by advocacy groups such as the Center for Democracy in the Americas and the Washington Office on Latin America to educate both Republican and Democratic members of the House and Senate about Cuban realities, Congress is finally emerging as a potential player on Cuba policy. Last week, in anticipation of Trump’s decision, a bipartisan group of senators reintroduced the Freedom to Travel to Cuba Act. When this bill was first introduced two years ago, it had only eight cosponsors; now it has 55—a reflection of how normalization, and the advocacy and lobbying interests it has unleashed, have dramatically changed the politics of the Cuba issue. 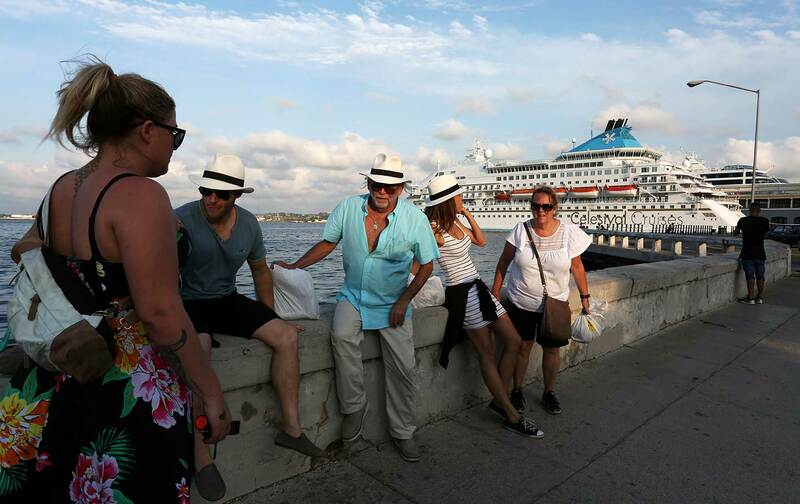 Last week, 46 travel agencies made a similar economic argument in a letter to Trump—one timed to support the introduction of the Freedom to Travel to Cuba Act. Organized by one of the leading travel providers, Cuba Educational Travel (which has helped coordinate The Nation’s Cuba trips), the signatories urged the new administration to consider the “benefits of increased travel to Cuba to both the American and Cuban private sectors,” and to continue the Obama-era relaxation of travel restrictions, which have led to a 73 percent increase in the number of US visitors to the island this year. An “economic impact” analysis released yesterday by the leading US business lobby, Engage Cuba, attempts to quantify the significant employment and monetary costs of rolling back the policy. Based on average plane-ticket prices and cruise-ship fares, the study estimated that restrictions on travel could cost up to $3.5 billion in lost revenues and affect over 10,000 jobs in the travel industry over the next four years. Jobs and revenue streams in South Florida would be hardest hit, with loses of $212 million per year to the state economy, should Trump cut off cruise ship travel to the island. “Manufacturing companies are finalizing commercial contracts that will create $1.1 billion worth of exports from the U.S. to Cuba over the next five years,” according to the impact analysis. “Ending this process could diminish U.S. exports by $227.6 million per year, or $929 million over four years.” Ending those export deals in progress, the study predicts, would affect 1,359 jobs a year.